The choice for Wednesday morning’s lead story was made easy for the media by Prime Minster Narendra Modi: His New Year interview to ANI editor Smita Prakash was the main story of the day. Leading newspapers feature it on Page 1 as well as their inside pages, with The Times of India giving it the most extensive coverage. The newspapers choose the PM’s comments on Ram mandir as their headline: The Hindu’s “Modi rules out ordinance on Ram temple for now”, is the most succinct, although Hindustan Times’ headline perhaps reflects the nuance of his comments better: “Ram mandir move only after court order: Modi”. There’s this too from The Economic Times: “Any temple ordinance only after SC order: PM”. Perhaps because the Ayodhya case will be taken up in the Supreme Court Friday, or due to space constraints, The Times of India, The Hindu and The Indian Express confine Page 1 coverage of the interview to Modi’s mandir remarks. Interestingly, while most newspapers, barring TOI, cover the Congress’s response to the interview on their inside pages, the RSS’ views make Page 1: In “Remarks step in the direction of building temple: RSS”, the Express writes, adding, “the RSS welcomed his remarks and expressed hope that the government ‘fulfil the promise’ in this tenure”. If you want to know what the PM said on economic issues, turn to Business Standard: It highlights Modi’s comments on economic issues, while The Economic Times goes with the political thrust of the interview instead. Business Standard’s choice for headline falls on farm distress and loan waivers: “Vicious cycle of loan waivers, elections must end, says PM”. The accompanying report reflects Modi’s statements on various issues, including demonetisation, GST, and helping farmers. In its opinion, it writes that the interview is “a veritable report card of his government’s performance and the contours of his election campaign”. This echoes The Hindu headline on Page 11: “As election year dawns, Modi gives a report card”. TOI is alone in mentioning the Congress’ response to the interview on Page 1 – “Cong: PM mum on failure to deliver on 2014 pledges” – although the best headline comes from The Hindu, “Full of ‘I’s and lies: Congress”. TOI also devotes almost an entire page to the ANI interview on Page 7, and confines the Congress’ rebuttal to the anchor position, under the headline, “PM didn’t talk about his failures: Cong”. Along with The Hindu, TOI chooses to storify the PM’s answers to questions on triple talaq, the surgical strikes, demonetisation, Urjit Patel’s departure from the RBI, the Sohrabuddin Sheikh case, and the “opposition-versus-janta” contest in the 2019 Lok Sabha elections. The Hindu also focuses on his response to relations with Pakistan. The Express and HT prefer to present his answers in one overarching story in their inside pages, quoting him word for word – that way, they are able to provide more of the actual interview for those who missed its telecast Tuesday evening. A curiosity – HT claims “Full interview: Pg 9”, when it ought to have said “excerpts from interview” in the interest of accuracy. The editorial pages will comment on the interview Thursday. Meanwhile, in its instant analysis of the interview on Page 1, Express concludes, “Bid to enthuse cadre: Chemistry over arithmetic”. “The Prime Minister’s first interview in a poll year comes after the Congress’s tri-state victory and its attempt to stitch a narrative – citing farm distress and jobs – that can forge a broader alliance…” it writes. Framing the forthcoming election as “gathbandhan versus janta”, it adds, “is a bid to project it as a battle between his chemistry… and the arithmetic of coalition in 2019”. 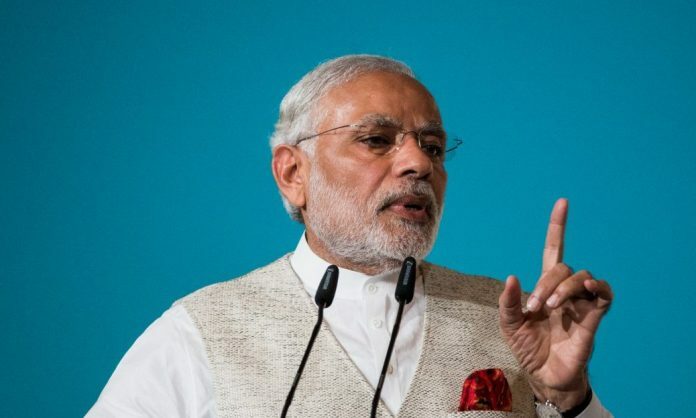 PM Narendra Modi’s 90-minute conversation with Asian News International (ANI) editor Smita Prakash was telecast across all new channels from 6 pm Tuesday. Subsequently, news channels favoured one of two options: Some replayed excerpts of the interview (NDTV 24×7), while others did an immediate spot analysis (India Today). However, by 8 pm, most had assembled their panels to discuss the contents of the PM’s conversation. India Today’s Rahul Kanwal concentrated on the purpose of the interview: Was it a PR exercise? BJP spokesperson Sambit Patra tried to avoid answering this particular question by shifting the focus of his answer to Congress president Rahul Gandhi. “Rahul Gandhi would not have lasted for 90 minutes in front of the camera. It is Modi who can answer these challenging questions,” he said. On the same theme, ET Now anchor Taneia Bhardwaj asked whether the questions put to Modi were all too easy. “He should have held a press conference where counter questions are asked,” he added. Other channels tackled specific issues raised in the interview. Goswami turned to BJP’s recent electoral setback in the Hindi heartland, and asked journalist Ashutosh if he agreed with Modi’s views on it. “Three states have already given the verdict that it’s not about Modi. It’s about unemployment, farmers’ crisis, petrol and diesel prices,” he replied. On NDTV 24×7, anchor Nidhi Razdan became extremely agitated over the PM’s dismissal of farm loan waivers in opposition-led states as “political stunts”. Reminding the panel and viewers that similar waivers had been given by BJP chief ministers in Uttar Pradesh and Maharashtra, she wondered if the PM’s remarks smacked of “hypocrisy”. Pavan Varma of the JD(U), a BJP ally, defended the PM, saying he had mentioned his own party’s loan waivers.